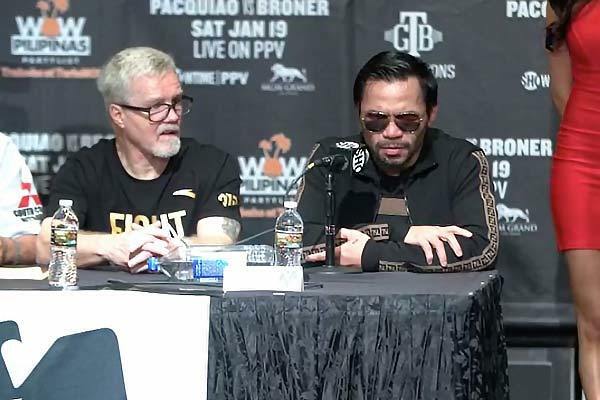 Manny Pacquiao speaks to the media after his points win over Adrien Broner in January 2019. WBA ‘regular’ welterweight champion Manny Pacquiao 61-7-2 (39) has repeated his desire to secure a rematch with the retired Floyd Mayweather Jr 50-0 (27). Speaking at the post-fight press conference after his comprehensive 12-round points victory over Adrien ‘The Problem’ Broner 33-4-1 (24) at the MGM Grand in Las Vegas, Nevada on Saturday night, Pacquiao called for potential challengers to come forward. “My message to Floyd, I’m still active and if he wants to get back in the ring, I’m here. Right now. I’ll ask my promoter Al Haymon to see what’s next,” Pacquiao, 40, said. Leonard Ellerbe, who represents Mayweather, quickly quashed the idea. “No, he is not interested. He has no desire and he is retired. Enough is enough. He has had a phenomenal career and has nothing to prove,” Ellerbe said. Another name to add to that list is Jeff ‘The Hornet’ Horn 19-1-1 (13), who defeated Pacquiao by close decision 18 months ago. “In his last five fights, Manny Pacquiao has only been beaten once, by Jeff Horn,” Horn’s promoter Dean Lonergan told Fightnews. “Given Pacman’s last two fights, a destruction of Matthysse and an easy win over Broner, Manny has shown he has plenty of gas left in the tank. It also shows that Jeff horn didn’t beat an old Manny Pacquiao. The Pacquiao versus Horn bout at Brisbane’s Suncorp Stadium was a blood-soaked affair after a clash of heads opened up a nasty cut on the Filipino icon’s scalp. Despite a strong ninth round Pacquiao gave away too many of the early rounds to claw back the win, with Horn being declared the winner by unanimous decision. “Pacquiao versus Horn was a brutal bloody war in Brisbane and the clear winner was Jeff Horn,” continued Lonergan. “A rematch of that fight, either in Las Vegas or Brisbane, where Pacquiao gets the opportunity to avenge that loss, should be a requirement by Floyd, along with the boxing public and broadcaster, to give a possible MayPac 2 the credibility it needs to go big.